Calling all parents and teachers! 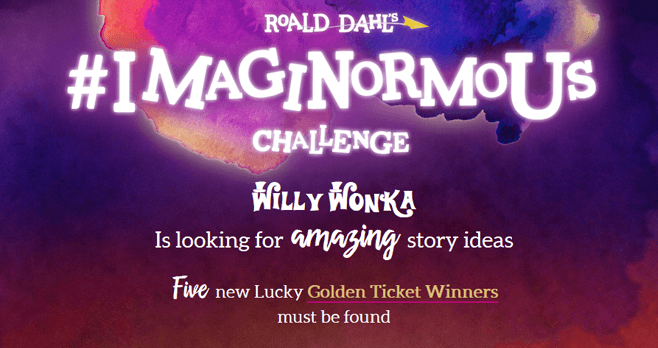 Starting on January 29, 2018, visit ImaginormousChallenge.com and sign up for the Roald Dahl’s Imaginormous Challenge 2018 because Willy Wonka is looking for amazing story ideas. Five lucky winners will receive a trip for 4 to to participate in a workshop with representatives from the Charlie and the Chocolate Factory the new musical team, the winner’s short story idea will be transformed into a theatrical creation. What You Need To Know About The Roald Dahl’s Imaginormous Challenge Contest At ImaginormousChallenge.com? Eligibility: The Roald Dahl’s Imaginormous Challenge Contest is open to residents of the 50 United States and the District of Columbia, who are ages 5 – 12 at time of entry. Sweepstakes Period: Begins at 8:00 AM Eastern Time on January 29, 2018, and ends at 11:59 PM Eastern Time on May 1, 2017. Random Drawing: On or about June 14, 2017, five winners will be chosen from all eligible entries received by the entry deadline. Entries will be judged on creativity and imagination, with equal weight given to each criterion. Grand Prize (5):A trip to participate in a workshop with representatives from the Charlie and the Chocolate Factory the new musical team, the winner’s short story idea will be transformed into a theatrical creation. Winner’s List: For a list of the winners, send a stamped, self-addressed envelope by December 14, 2018 to The Imaginormous Challenge, Penguin Young Readers Group, Attention: The Imaginormous Challenge, 345 Hudson Street, New York, NY 10014.